When we started our brand new THN Deals Store last week on the special occasion of company's 6th Anniversary, we introduced its very first product, Professional Hacking Certification Package, and received great response from our readers. If you have not yet, you can still get this deal — Computer Hacker Professional Certification Package — at 96% discount. This Package offers you all the material and training you require to help pass any of five professional hacker certifications, including CISSP, CISM, CISA, Ethical Hacker and Forensics Investigator to become certified penetration tester. It is a very well known fact that nobody can teach you hacking directly. You need to learn some programming languages to get started, as well as to have knowledge of some basic platforms. I frequently receive emails and messages on what programming language should we learn? So the answer is — Python. But, Why Python? Because it is an excellent programming language that has rapidly become popular among Hackers, Reverse engineers, software testers, Forensic analyst and Penetration testers, as most Python programs run on all the key operating systems including Windows, Linux, Mac, and more. So, if you are a beginner who really wants to learn Python, or you already know Python but wants to learn advanced penetration testing skills using Python, today's THN Deals will help you choose an excellent Python course. While most courses introduce you to simple techniques based on unrealistic situations with completely unsecured systems, this Python For Offensive PenTest is a practical course that teaches you the real skills you need to become a better pen-tester. This 6 hours of online Python training offers penetration testers, network administrators and security enthusiasts the concepts and techniques to create their own tools from scratch, rather relying on ready-made tools. At THN Deals Store, you can get this Python For Offensive PenTest course for just $26 after 35% of flat discount. 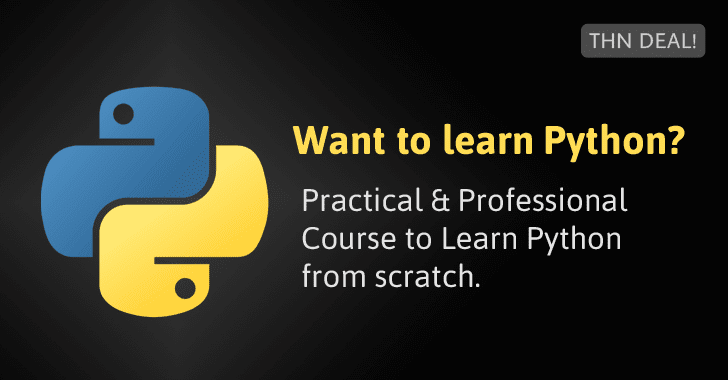 The Python Power Coder Bundle is an online Python course for beginners, who want to learn Python from the ground up as create their own websites and databases. This 38 hours of online Python Power Coder Bundle will introduce you to this versatile language with five courses that will teach from fundamentals of coding to building seven apps from scratch and games using Python. Here’s the deal: At THN Deals Store, you can grab this Python Power Coder Bundle for just $45 after 85% of flat discount off the retail price.